2015 is in full swing and I am slowly trying to get myself back on a schedule after the craziness and excitement of the holidays. Every year I try to set simple goals instead of resolutions and this year. as always, I am trying to eat better and take better care of myself. A huge part of doing this is setting aside some time for myself. When Justin is on shift I tend to rush around running errands and getting things done and I usually end up grabbing take out or heating something up from the freezer. In 2015, my goal is to take 30 minutes for myself each evening to relax and recharge and to cook myself a homemade meal on nights when Justin works. One of the difficulties I always face when cooking for just myself is that most recipes I use are way too much for one person. So I decided to grab some magazines for inspiration and look for recipes that could easily be adapted for single servings. During my last Walmart trip, I grabbed the latest issues of People and All You and when Justin went to work last weekend, I grabbed a glass of sparkling water and my hot pink sticky page markers and got to work. All You was filled with tons of recipes that could be made quickly and easily for one person so I had a hard time choosing where to start. I knew our upcoming work week would be crazy so I settled on something that I could make myself a single serving of and then freeze the rest for later in the week. Anyone who knows me will be shocked to learn that Broccoli Pesto was my first choice. It's not that I am against eating vegetables, I just don't happen to be the biggest fan of them and broccoli is usually at the top of my "do not eat list". But since my main issue with broccoli is the texture (little trees freak anyone else out? 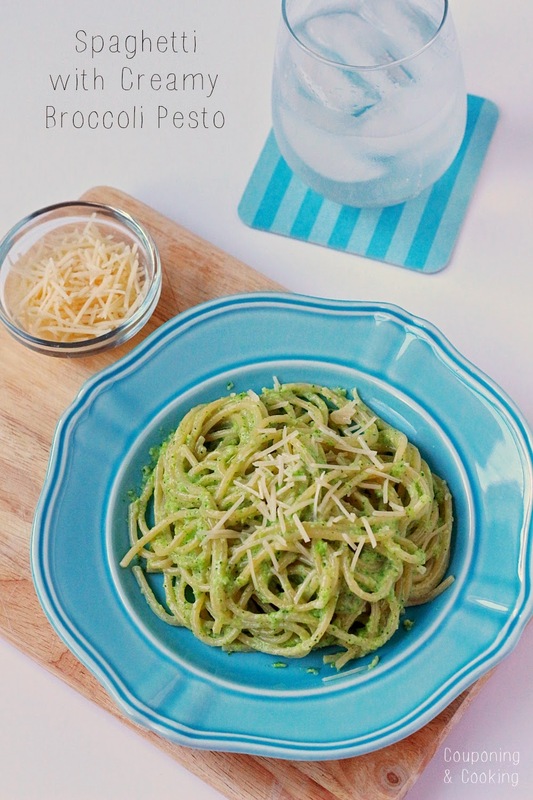 ), I figured that this creamy pesto would be a perfect way to sneak some veggies into my meal without having to eat entire pieces of it. I love how creamy this sauce was and I almost couldn't even taste the broccoli. This recipe was already super easy but I made a few changes to make it even simpler. Instead of cooking my own broccoli, I went with a steam in the bag variety. With all the New Years sales, I was able to find a great deal on an organic frozen variety. I also used jarred minced garlic because when Justin isn't home, I don't have my sous chef so I try to use the minimum number of steps I can when cooking. 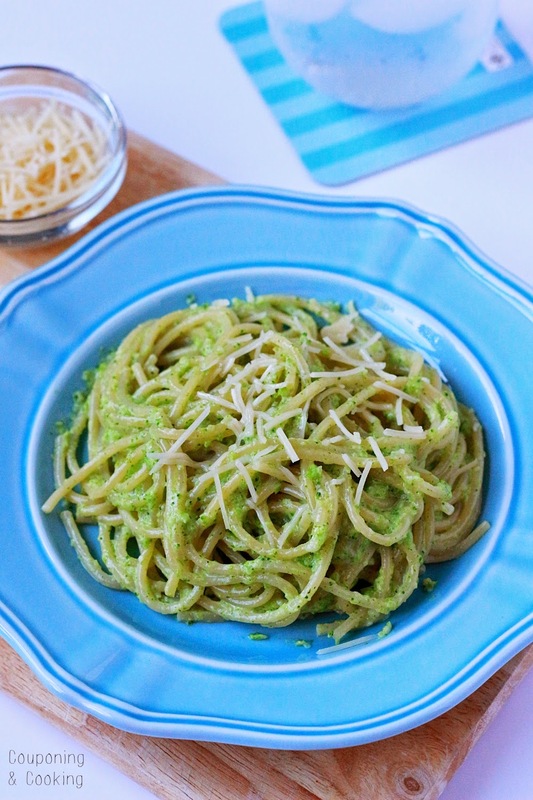 I love that I was able to make myself a single serving of pasta to toss with the pesto because it eliminated wasted leftovers and kept my portion size under control. I froze some of remaining pesto into single servings and one serving for two so Justin and I could have an easy weeknight dinner. Looking for some me time for yourself? Be sure to check out Walmart's great selection of magazines filled with all kinds of inspiration for new dinner options, organization tips, home decor ideas and more for the New Year. Right now you can save $1 on ONE (1) PEOPLE®, InStyle®, PEOPLE StyleWatch®, All You®, or Real Simple® magazine. The Walmart digital coupon is available 1/14/15-2/16/15 (while supplies last). Be sure to visit Walmart.com and print out the coupon. 1.) Steam broccoli in bag according to the directions on the package. If using fresh broccoli, be sure to cook it before hand. 2.) In a food processor, combine cooked broccoli, olive oil and garlic. Process until smooth. 3.) 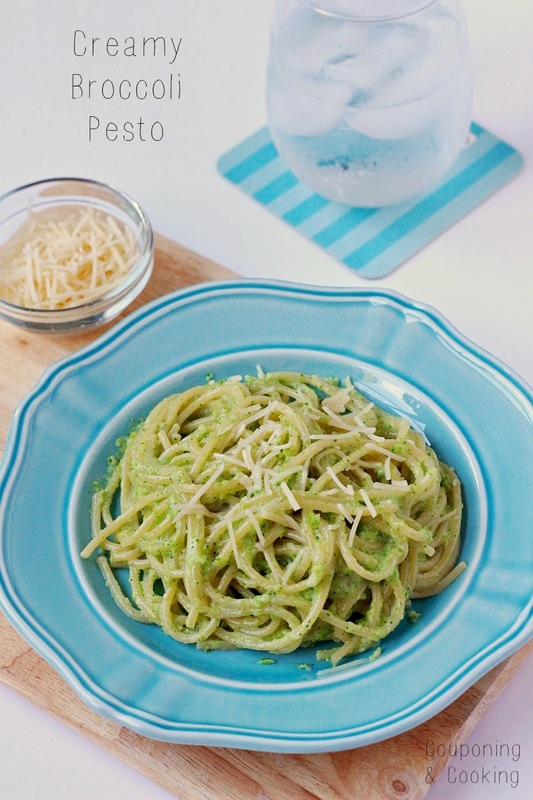 In a large bowl, combine broccoli mixture, cream and parmesan cheese. Add salt and pepper to taste. 4.) Boil a single serving of pasta. * Drain and reserve some of the pasta water. 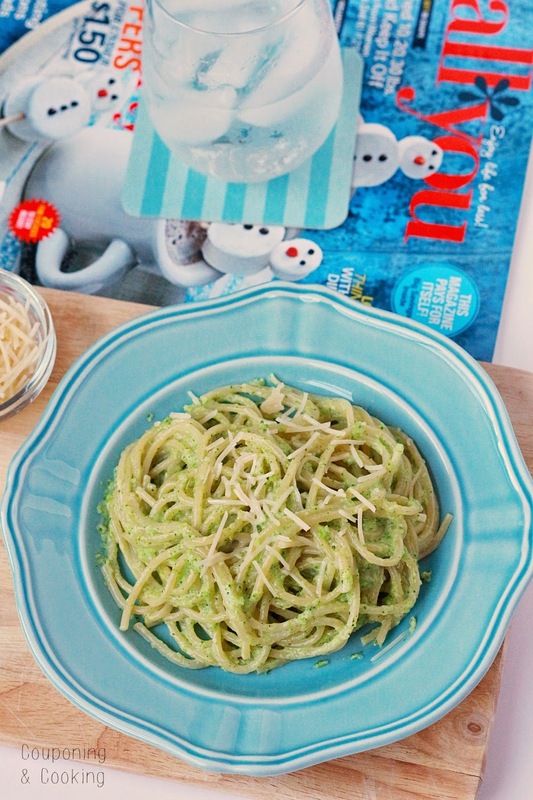 In a small saucepan on low heat, toss the cooked spaghetti with 1/4 cup pesto mixture using reserved pasta water to loosen the pesto to your desired consistency. Serve immediately and top with additional parmesan cheese. I froze the remaining pesto in single serving containers so I could make myself a quick and easy single serving of pasta any night of the week. *This recipe makes enough to toss a pound of spaghetti however I adapted it to serve just one but cooking a single serving of pasta. I really like your weblog for those exquisite pointers of clothes. it's miles very appealing and additionally the collections are unique. custom essay writing service I constantly observe your weblog to rise up to this point with new traits. thank you a lot for this post. maintain blogging with extra thoughts.